By 1870, everyone was trying to invent another crank operated machine gun. In Gardner's case, he probably came up with the best of the lot. His gun was simple, reliable, easy to disassemble to clear jams, and with a team of loaders, could keep firing with no interruption. The gun was invented by William Gardner, a veteran of the American Civil War. After producing a prototype, and not being able to afford to manufacture his new gun, he sold the American patent rights to the Pratt and Whitney Company. They improved the gun, including a more positive control of the rounds after leaving the gravity feed magazine, It was demonstrated to the US Army in 1979-1880, and was received well, however the army was wedded to their Gatlings, and declined. The British took to it immediately, in 1881 it was approved, and the Admiralty took over British production, enlisting Gardner himself to help supervise construction. Gardner stayed in England for the rest of his life. The original factories are believed to have been in London and Leeds, according to an old Toledo newspaper, Gardners home town. 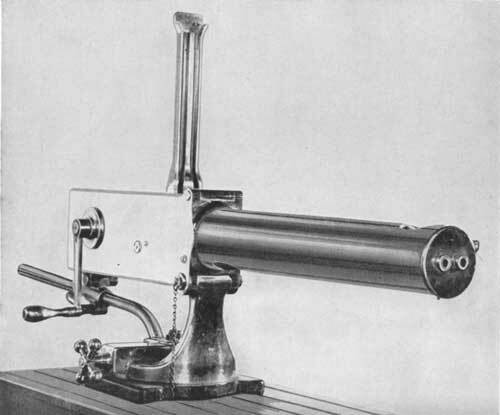 The Gardner gun, usually from one to five barrels, was a hand crank operated weapon, turning an automotive style crankshaft and fed from a gravity feed magazine. A simple and robust design, it was easily disassembled for repair and to correct ammunition jams. Some guns had a water jacket around the barrel(s) to keep the heat down. The barrels can be changed quickly, thought necessary at the time as it was a black powder weapon and subject to powder fouling. This feature was a precursor of modern machine guns. The standard gun was a 2 barrel affair, and fired both barrels at one turn of the crank. 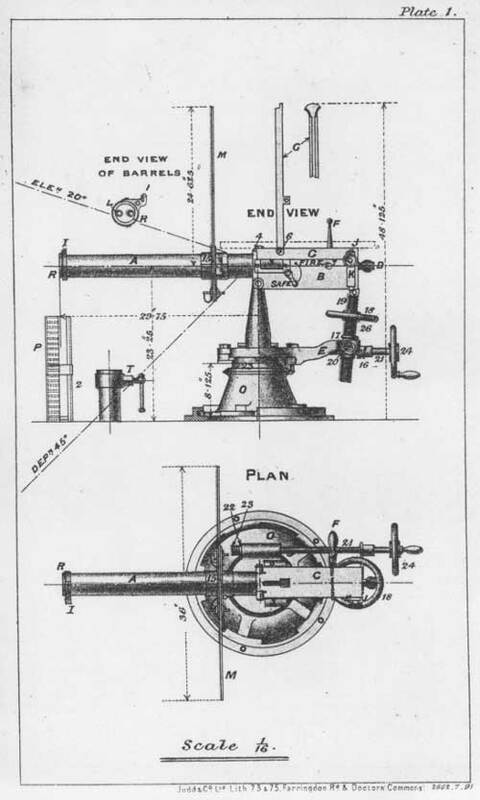 Unlike the Gatling, a safety could be switched, letting live rounds feed through the gun without firing. A feed valve can also be closed off, allowing the clearing of the gun with a full magazine at the ready. The design of the bolts delays unlocking the breech for moments after firing, necessary for hang fires. A cover locked by a quick operating latch can be opened to service the internal parts of the gun. And it all comes in brass bronze and steel, the industrial revolution's favorite metals. The .45 caliber ammunition came in boxes that, when opened, exposed the rims of the bullets. In this way a whole box could be guided down the U-shaped channel of the magazine quickly then pulling the box away. 3 men could keep the gun in continuous operation. A tripod mount was eventually fitted as the gun wasn't near as heavy as the Gatlings. Gardners were used alongside Gatlings in the Sudan and Egyptian campaigns. During the attempted relief of Khartoum in the Sudan, a British column met the Mahdist forces at the wells of Abu Klea, on January 18th, 1885. In the first clash in desert conditions, the Gardner gun didn't fare as well as hoped, as it jammed after the first 70 rounds were fired.. The gun, as most British machine guns of the time, was fielded by the Naval Brigade. The crew was killed by the Dervishes, but the gun was not lost. A lot of the British casualties were the result of spear wounds. Later, in December 1885, Gardner guns were used in the battle of Ginnis. One of the guns was mounted on the riverboat 'Lotus' and covered the British forces on the shore. The British shortly thereafter withdrew from the Sudan, but when the British returned thirteen years later they brought their Maxim guns. The day of the Dervishes was then brought to an end. 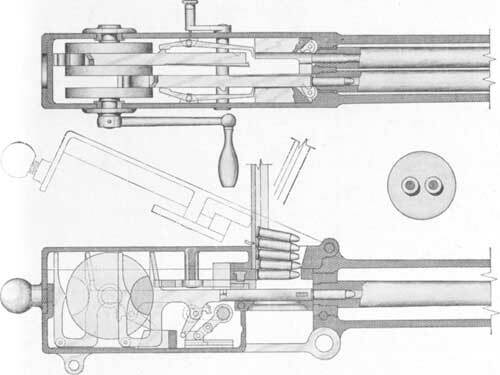 Later attempts to modernize the Gardner were tried, a belt fed version was built but failed in trials. The day of the hand cranked machine gun was doomed when the bullets own energy was harnessed to cycle the gun's action.